Introduction Worldwide, there are an estimated 50 million people affected by epilepsy. Its aetiology is manifold, and parasitic infections play an important role, specifically onchocerciasis. In onchocerciasis endemic areas, a distinctive form of epilepsy has been described as nodding syndrome, affecting children and causing nodding seizures, mental retardation and debilitating physical development. Onchocerciasis control programmes using community-directed treatment with ivermectin (CDTI) are implemented in endemic countries. This study is designed to contribute to a better understanding of the linkage between the onset of epilepsy, onchocerciasis and CDTI. Comparing the epidemiological data on epilepsy and onchocerciasis from pre-CDTI and 20 years after its introduction will allow identifying a potential impact of ivermectin on the onset of epilepsy. Methods and analysis The study will be conducted in the Mahenge highlands in Tanzania. Study site selection is based on an in-depth study on epilepsy in that area dating from 1989. CDTI was introduced in 1997. By a door-to-door approach, the population will be screened for epilepsy using a validated questionnaire. Suspected cases will be invited for a neurological examination for case verification. Onchocerciasis prevalence will be assessed by a rapid epidemiological assessment. As an indicator for ongoing transmission, children younger than 10 years of age will be tested for Ov16 antibodies. Ivermectin use will be assessed at household level. Epilepsy data will be analysed in comparison with the 1989 data to reveal pre-CDTI and post-CDTI prevalence and incidence. Ethics and dissemination The protocol has received ethical approval from the ethics committees of the University of Antwerp, Belgium, and of the National Institut of Medical Research, Dar es Salaam, Tanzania. The findings will be published in peer-reviewed journals, and presented to the health authorities in Tanzania, at national, regional and village level. This study will allow comparison of large-scale population-based data on epilepsy epidemiology in Mahenge over a period of 28 years. The strength of the study is that it is a first study to follow-up epilepsy epidemiology in the Mahenge area since the introduction of community-directed treatment with ivermectin (CDTI). The comparaison of the data obtained in 1989 and 2017 will be challenged by the slightly different study methodologies used. The study design is limited in accounting for potential confounding factors other than CDTI that may influence epilepsy incidence and prevalence. Focusing on villages with high epilepsy burden in the past may lead to an overestimation of the potential impact of CDTI. The endemicity of onchocerciasis and the prevalence and incidence of epilepsy are influenced by a multitude of factors (figure 1). These factors are of uncontrollable nature (climate, environment and ecology) and of controllable nature (prevention and intervention programmes, access to healthcare and treatment). 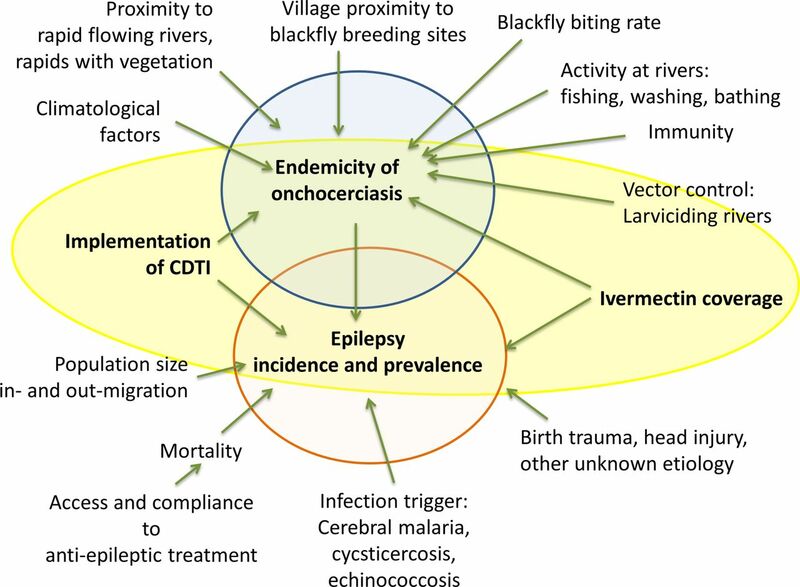 Onchocerciasis endemicity and prevalence and incidence of associated epilepsy are influenced by an extensive network of controllable and uncontrollable factors. CDTI, community-directed treatment with ivermectin. The population-based study from 1989 by Rwiza et al 43 established the baseline prevalence of all forms of epilepsy in the Ulanga district, Tanzania. This population-based study aims to further evaluate the prevalence and incidence rates of new epilepsy cases, including a complete case ascertainment of all forms of epilepsy encountered and compare the data to the 1989 data (table 1). The main objective of this study is to identify the potential impact of long-term onchocerciasis control using CDTI on the prevalence and incidence of epilepsy in selected villages in the Mahenge area of the Ulanga district in Tanzania. to investigate the potential difference in clinical appearance of epilepsy in patients with negative onchocerciasis serology to patients with positive onchocerciasis serology. The study consists of two parts: (1) a study to determine the prevalence and incidence of epilepsy and (2) a study to determine ivermectin coverage, onchocerciasis prevalence and level of transmission. Data collection was carried out between January and September 2017. Analysis is planned to be finalised by end of 2017 to allow publishing of the results in 2018. The study is taking place in the Mahenge area of the Ulanga distict, Morogoro region in southeastern Tanzania, a mountainous area with fast-flowing rivers. The three villages, Mdindo, Vigoi and Misegezi, that had high epilepsy prevalence during the 1989 study will be selected for this study.43 The entire population of each of these villages will be included in the study. In a second stage, persons with suspected epilepsy identified during the household screening survey will be further invited for clinical examination by a neurologist. The examination will include neurological tests and a detailed interview for case verification. In verified epilepsy cases, the onset of the seizures will be determined and possible aetiological factors will be investigated, such as birth trauma, head injury, meningoencephalitis, cerebral malaria, neurocystocercosis and the history of onchocerciasis. For persons with suspected epilepsy, their serological status will be determined using onchocerciasis rapid diagnostic test (Ov16 RDT) (Standard Diagnostics, Gyeonggi-do, Republic of Korea). According to Rwiza et al the average prevalence of epilepsy in five villages with high prevalence was 1.313% (table 2). If we assume a reduction in the prevalence by 33.3% to be able to compare the prevalence at a power of 80% and 95% confidence level, the minimal sample size of 4746 individuals will be required. Assuming a participation of 80%, a minimum source population of 5933 is necessary to obtain optimal sample size. Since 1989, the population in the villages with high epilepsy prevalence has increased (table 3). For this survey, we will include only the population of the villages with the highest epilepsy prevalence in 1989. The total population of the selected villages of Mdindo, Vigoi and Misegezi in 2016 is about 7766. The community survey will commence by a questionnaire interview with the village authorities on demographic topics and with village health workers to address general questions on the status of epilepsy and epilepsy treatment in the village. A complete door-to-door active screening for persons with suspected epilepsy at village level will be performed. The interview team will be trained on how to conduct the active search for epilepsy cases using a pretested, validated screening questionnaire targeting epilepsy by five specific questions (provided in the online supplementary material).50 51 For validation, the questionnaire will be translated to Kiswahili, pretested and retranslated to English. The locally used terms for the two respective conditions will be used (epilepsy: kifafa and NS: kusinzia kichwa). To ascertain completeness and to ensure the best collaboration with the village population, the interviewer team will be accompanied to all households by local village health workers. The geographical coordinates of the participating households will be collected for the mapping and geospatial analysis of cases (proximity to rivers and potential clustering). All persons with suspected epilepsy identified during the door-to-door survey will be verified by a neurologist. The neurologist will perform a detailed anamnesis on all persons with suspected NS and epilepsy. In case of confirmation of the epilepsy, the neurologist will perform a medical examination and administer a detailed questionnaire on the type of epilepsy. Newly diagnosed epilepsy cases will be referred to an epilepsy treatment centre. In case the person is already followed in a treatment centre, permission will be asked to review the medical information available in the treatment centre to record epilepsy diagnosis and epilepsy treatment history. A case will be considered as active epilepsy if the patient is receiving epilepsy treatment or, if without antiepileptic treatment, the patient presented at least one seizure during the last 5 years. A case of suspected NS will be defined as a person who presented with episodes of decreased consciousness during which the head dropped forward repeatedly. New cases of epilepsy will be defined as cases that appeared within the last 12 months preceeding the study period. The second approach aims at determining the level of transmission of onchocerciasis in the selected villages. Therefore, serological testing for onchocerciasis will be done in all children aged 7–10 years, using the onchocerciasis specific Ov16 RDT (Standard Diagnostics). According to the National Census survey in 2012, the population of children aged 7–10 years represented 11.6% of the population in Ulanga district. Estimated population of children aged 7–10 years from the four selected villages is 900, of which 722 (~80%) are anticipated to participate in the survey giving a power of 85% in detecting the prevalence between 0.8% and 2% at 5% significance level (table 4). Data collection will be done using numeric tablets. All data collection forms will be developed in the open-source software ‘Open Data Kit’ (ODK, https://opendatakit.org/). Interviewers will be trained in how to perform tablet-based surveys. A technical data coordinator will be assigned to guarantee completeness and quality of data and to assure daily data transfer from each tablet to the central server for data security. The prevalence of epilepsy and NS will be computed as a ratio of the number of epilepsy and NS cases per total number of people registered in the households visited, respectively. The incidence of new cases of epilepsy is defined as the number of persons who developed epileptic seizures within 2 years preceding the study, divided by twice the population size, assuming that the change in population within the 2 years has a minimal effect on the incidence. Results will be presented accompanied with 95% CI and P<0.05 level of significance. Prevalence and incidence will be compared between villages and with the 1989 data. Ivermectin treatment coverage and onchocerciasis prevalence will be calculated. Proportions will be compared using χ2 test, while means will be compared using t-tests. Demographic and clinical characteristics of persons with epilepsy having a positive Ov16 serology will be compared with epilepsy cases with negative Ov16 serology. Ivermectin treatment coverage, epilepsy prevalence and incidence and OV16 positivity rate among children aged 7–10 years will be compared among villages, weighted for the difference in population size between villages. ORs will be calculated for epilepsy cases with positive Ov16 results, and the association of Ov16 positivity and epilepsy will be analysed by age group. Before the activities start, the research team will hold meetings with community leaders and health workers of the selected villages. The procedure, purpose and specific aim of the study will be explained and discussed with regard to the potential risks and benefits for the community. Community leaders, village health workers and researchers will maintain the initially established communication for the entire duration of the study. The dissemination of results will be organised in a similar way as the initial meeting. As approved by the relevant ethics committees, only participants who provide written informed consent will be enrolled in the study. Participant information sheets and consent forms will be available in English and Kiswahili. In case of illiteracy, information sheets and consent forms will be read to the participant in the presence of a witness. All participants will be permitted to withdraw from the study activities, without reason, at any time. All personal information, samples and test results will be encoded and treated confidentially. People identified with untreated epilepsy or with interrupted treatment will be referred to the treatment centre and will receive advice for care and support. All data files will be centralised and stored in a secured central server. Name-linked information on participants and ID codes will remain confidential and will be used only to communicate clinical results to participants for their respective treatments. The central research question of this study is to determine whether mass ivermectin administration using CDTI has the potential to prevent the onset of OAE. The expected results will contribute to a better understanding of the linkage between the onset of epilepsy and NS in particular, onchocerciasis and the impact of CDTI. In northern Uganda, an NS epidemic has been halted after introducing a programme combining CDTI and larviciding of the main rivers. This study will be the first to investigate systematically whether CDTI alone may reduce epilepsy in an onchocerciasis endemic region. To do so, pre-CDTI and post-CDTI epilepsy prevalence and incidence data will be compared. Concurrently, with the Ov16 serological survey among children aged 7–10 years, it will be possible to assess wether the transmission of onchocerciasis is ongoing in the Mahenge area after 20 years of CDTI. To date, the onchocerciasis control programme in the study area was monitored based on the annual data on total ivermectin distribution and the treatment coverage data provided by the community distributors. Also, ivermectin treatment coverage data will be assessed in the framework of this study by interviewing the population. Moreover, by performing an Ov16 seroprevalence study among children under 10 years of age, a real-time estimate of the level of ongoing transmission of onchocerciasis will be evaluated. The hypothesis is to find a low Ov16 seroprevalence in children and a decreased prevalence of epilepsy since 1989. In case a high Ov16 seroprevalence is found, this will suggest that the CDTI programme was performing suboptimal and/or that ivermectin resisitance may have developed. It might therefore be useful to combine CDTI with larviciding rivers to reduce blackfly abundance. This study also has limitations. The methods used will not allow for measuring onchocerciasis infection intensity, one of the main factors influencing the development of OAE. There is a possibility that it may not be possible to show an impact of CDTI because, in case of high-level exposure to infectious blackflies, the administration of ivermectin only once a year may not be sufficient to considerably decrease onchocerciasis transmission. Moreover, in pre-CDTI and post-CDTI comparison, it is possible that observed differences in epilepsy prevalence and incidence are not related to the intervention (CDTI) but to some of the other factors (eg, those mentioned in figure 1) that might have changed over time. However, a site visit to the Mahenge study site revealed that the village population had increased by a factor of 3, but there was no important inmigration or outmigration or any other major change in lifestyle of the population or another major environmental change. In all the villages included in the study, such potential changes will be carefully assessed to control for potential confounding factors. Families who migrated into the study area after the implementation of CDTI will not be included in the analyses. This study aims to unravel the potential impact of CDTI on reducing the incidence of epilepsy in onchocerciasis endemic areas. Study results may provide evidence that strengthening CDTI programmes could prevent the onset of OAE. The results and lessons learnt from this study will be disseminated by publications in open-access journals, as well as presentations at scientific conferences and shared with all interested health authorities in Tanzania and beyond. We are grateful to Dr Alfred Kilimba and Dr Yohanna Mahenda, Epilepsy Clinic Mahenge, Tanzania, and the health authorities in Vigoi, Mbindo and Misegezi for the fruitful discussions during our visit and for their input that provided background information and practical considerations for the development of the current study protocol. WHO. Investing to overcome the global impact of neglected tropical diseases. Third WHO report on neglected tropical diseases. Geneva: World Health Organization, 2015.
. Epilepsy and Onchocerciasis: Pioneering research of Mexican physicians vindicated. Investigación en Salud 2004;VI(1:22–7.
. Prevalence of nodding syndrome--Uganda, 2012-2013. MMWR Morb Mortal Wkly Rep 2014;63:603–6.
. Clinical and epidemiologic characteristics of nodding syndrome in Mundri County, southern Sudan. Afr Health Sci 2012;12:242–8.
. Epilepsy and retarded growth in a hyperendemic focus of onchocerciasis in rural western Uganda. East Afr Med J 1992;69:554–6. WHO. Preventive chemotherapy in human helminthiasis. Coordinated use of anthelminthic drugs in control interventions: a manual for health professionals and programme managers. Geneva, Switzerland: World Health Organization, 2006.
. The present status of onchocerciasis in Tanzania. A review of the distribution and prevalence of the disease. Trop Geogr Med 1970;22:345–51.
. Endemic onchocherciasis in the Ulanga area, Tanzania. Acta tropica 1965;22:70–3.
. Onchocerciasis prevalence in Tanzania. Cent Afr J Med 1990;36:94–6.
. [Dépistage de l’épilepsie en zones tropicales: validation d’un questionnaire en Mauritanie]. Bull Soc Pathol Exot 2006;99:103–7.
. Questionnaire d’investigation de l’epilepsie dans les pays tropicaux. Bulletin de la Societe de pathologie exotique (1990) 2000;93:276–8.
. On the biology of Simulium damnosum Theoblad, 1903, the main vector of onchocerciasis in the Mahenge mountains, Ulanga, Tanzania. Acta Trop 1969;26:29–69. Contributors All listed authors contributed to the development of the study design, essential study documents and study tools. According to their different areas of expertise, the authors critically revised specific parts of this manuscript: HG wrote the manuscript; HG, BM, PS and RC developed the study protocol; WilliamsM, MM, WilliamM developed and approved the neurological study protocol and the survey tools; HG, BM and AK developed the methodology and tools for the digital data collection; HG, BM and RC visited the study sites. Funding This research is embedded in a five-country research project on epilepsy, nodding syndrome and onchocerciasis entitled ‘NSETHIO’, and receives funding from the European Research Council, Advanced Grant (ERC-2014-ADG), grant no. 671055. Ethics approval The protocol has received ethical approval from the ethics committee of the University of Antwerp, Antwerp, Belgium (29 August 2016) and the National Institute of Medical Research (NIMR) ethical committee Dar es Salaam, Tanzania (24 August 2016).